There are a lot of flooring ideas out there and most incorporate a variety of styles, colors and textures. When it comes to putting or replacing your floor, it is important to consider the costs, benefits and shortcomings of the flooring ideas you have in mind before you commit. Here is a list of the most popular flooring tends for Africa, their advantages and disadvantages, and the particular rooms they are best suited for. There is a wide variety of tiles available in the African market; glazed ceramic tiles are very durable, resistant to scratches and also water resistant. Tiles come in a variety of sizes and materials, such as marble, porcelain, travertine, slate, and granite. Additionally, they are fairly easy to clean, and stains are not much of a concern. Since tiles are resistant to water, they are perfect for bathrooms or kitchens. They may also be convenient in a dining area where food and drinks tend to be spilled frequently. According to Mr. James Kiio of Liberty Ceramics Limited, an upswing in constructions activities owing to the increasing urbanization is boosting the demand for tiles, significantly across our country Kenya; thus leading to substantial thrust in tiles business, i.e. the demand for tiles remains high. Accept no imitation, the ceramic tiles found in the Evolution tile collection are a picture of sophistication and give reference to early craft style design themes. This natural tile range enjoys flexibility in a range of popular sizes and traditional thickness while benefiting from a comprehensive collection of special pieces including step treads, skirting, bullnose and mosaics. The never-ending patterns found in Blueprint Ceramics Tangle tile range create graphic perimeters that test the human eyes limits! Originally evolved from an old geometric construction housed with a square border, the lines of Tangle join at their mid points and fan out until L-shapes can be identified within the pattern. This creative project stemmed from the various structural elements and primordial themes of a natural stone product, named ‘creative’. Taking a stone which looks at home in a Nordic lake Blueprint has re-imagined its natural yet simple features. Formulated and characterized by a mixture of size and grains it is available in Natural, Structured, Graffio and Mixed textures. Aimed at architects and professional designers it benefits from a large range of differing cuts and tones supplied in a variety of size formats. The Creative Tile collection can enhance your design with a natural yet striking finish which is sure to attract attention. Carpets not only possess a soft feeling, but also give a soft look to a room. They are quiet to walk on and prevent echoing. It is quite simple and quick to install a carpet, and they can also go over uneven subfloors. However, although advancements in fiber technology have enabled carpets to be more stain-resistant, they are still prone to stains. Regardless of how frequent they are vacuumed, they still may contain hidden dirt. Occasional steam-cleaning is needed to keep the carpet fresh; plus they are not good for people with allergies. According to Mr. Christopher Champlin of Shaw Contract, the popularity of carpet tiles makes it the priority for the African Market. “The flooring industry is seeing a lot of development in creating quality hard surface options with the look, design and texture of natural floors. In carpet tile we are seeing a greater need for versatile design options and textures and colors,” he adds. Shaw Contract is the manufacturer of Ecoworx, the industry’s first carpet tile backing to achieve the coveted Cradle to Cradle environmental certification. “Our Ecoworx carpet tile backing leads the way in recyclability as it can be returned to Shaw Contract,” affirms Mr. Champlin. He further adds that, different customers have different purchasing drivers. “We all have to work within ever reducing budgets; however, we also need to be cognisant that all price and value go hand in hand. The Shaw Contract product portfolio has a range of different products to meet the various quality, performance and budget demands of most purchasers,” he asserts. Carpets are best suited for low traffic rooms, like bedrooms, to minimize the trapped dirt that gets. They also give bedrooms a cozier look and feel. The price of the hardwood will depend on the type of hardwood you go for; engineered wood will cost you a little less. Hardwoods have a presentable appearance plus a great resale value. They are quite easy to clean and maintain and normally only require vacuuming. The living room is the best place to put hardwoods. It is not a high-traffic area such as a foyer, plus they bring out a good stylish look. Sara of Timberwolf argues that, according to recent studies, buildings using wooden building materials do not only reduce CO2 emission, but also have positive impact on the environment by helping achieving sustainability. “This was presented at the 2017 Dubai WoodShow. This could be advantageous in this region to support Dubai’s ongoing effort towards a greener economy in the attempts to provide affordable Eco-friendly houses,” she said. Timberwolf purchases raw material from Africa and processes it in their factory in Dubai into wooden flooring, pergolas, cladding and decking. “We primarily buy Dabeema and Iroko but sometimes have requests for Meranti and Acume,” said Sara. According to Cynthia Winki the founder of Stroika, African countries are slowly embracing bamboo flooring. 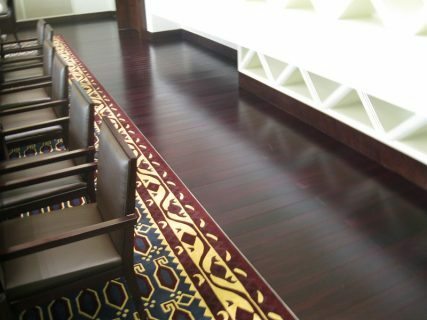 “Ethiopia and South Africa are spearheading the adoption of eco-friendly flooring with the former going to an extent of setting up a commercial processing plant with the capacity of manufacturing and exporting 100,000 square meters annually. The demand for renewable flooring for projects is growing from developing countries like the DRC and Ghana. In Kenya, private-public partnerships and the national forestry institute along with the private sector are raising interest in bamboo by promoting contract farming, providing technical assistance for bamboo crafts in general, with the future being the processing of the bamboo into flooring planks among other uses.” she says. Established in 2013, Stroika Group is one of the biggest supplier and installer of bamboo flooring for in Kenya. Looking at the future, Cynthia says we are moving fast towards an age that is more aware of the environmental impact of construction material, architectural design and interior finishes. Eco-friendly renewable choices for building finishes are a growing industry segment. “We foresee easy-to- install flooring planks growing in popularity in the market. The ease of installation reduces project cost/time challenges and provides allowance for repair and maintenance of floors.” she adds. Laminate does not easily scratch, in case it does, a little vegetable oil rubbed on the scratch is enough to get it right out. It can also look like real wood or tile, and it can even be rather difficult to tell if it is real or not. Like hardwoods, laminate is also simple to clean. It is even possible to make your own cheap and natural house cleaners. It is also great for pets because they can neither scratch nor stain it. However, stagnating water will ruin laminate flooring. If the laminate does get ruined, unlike hardwoods, they cannot be refinished. Laminate is a great flooring idea for high traffic areas like a foyer or any room that welcomes a lot of activity because of its durable nature. It is highly recommended to avoid putting it in a kitchen, bathroom, or a laundry room since laminate should not get wet. According to Mr. Paul-Lucas Lambert of Decomagna Limited in Kenya, a supplier of high end laminate, engineered wood and vinyl flooring in Kenya and East Africa; Kenya and East Africa has a very big market for laminate products, with growing interest in the up-market manufacturers. “We cater for all markets and keep very competitive prices in order to push the industry and demonstrate what true quality products mean,” he adds. He further explains that, the difference between good quality and poor quality laminates is unimaginable, and people are starting to notice. “There is a big demand for laminates but less for engineered wood due to the high price. Also, top brands in laminates source their wood from renewable sources and have no impact on the ecosystem, whereas engineered wood still depends on actual wood from specific region. Currently the price of engineered wood is rising due to more and more shortages,” he affirms. Like carpet, vinyl is quiet and easy on your feet. It is inexpensive compared to some of the other flooring types. However, although vinyl has evolved so much and can be made to look like tile or wood, it still does not look as great as the real thing. Vinyl dents and tears easily, plus it is slightly challenging to clean them. Vinyl is great for a laundry room as it can shield a lot of the sound from your laundry machines. It could also work well in bathrooms and the kitchen because of the warmth it adds. According to Wendy Mitrovich of Polyflor SA, the vinyl market is doing well. 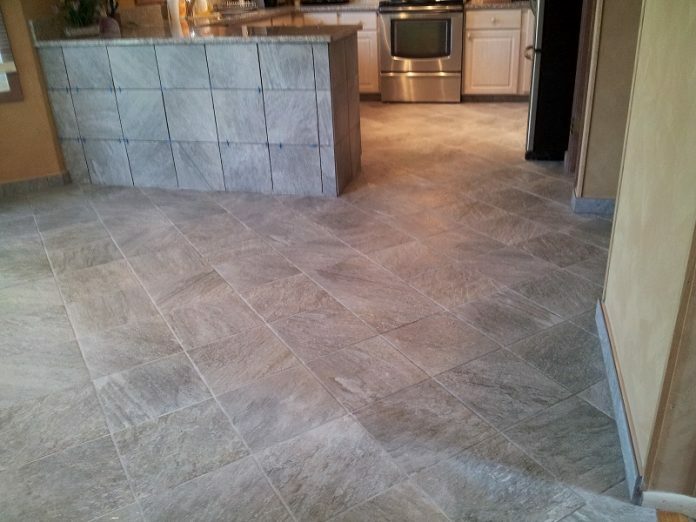 Vinyl has become a very sought after flooring solution for many different applications in many different markets. “Its versatility and design options allow for application from traditional healthcare markets to retail, education and hospitality applications that offer a functional, long lasting floor that also looks fabulous and meets client expectations,” she adds. She also affirms that, choosing a vinyl floor is more complex than simply colour and design. The floor must be fit for purpose, meeting requirements for traffic conditions, special needs like slip resistance, maintenance requirements as well as design needs. “Understand the subfloor requirement for vinyl flooring and ensure you specify the correct floor preparation. Make sure your installers are well trained in vinyl fitting and do a good installation. If you follow this you will end up with a floor that will last way beyond 20 years,” she adds. According to a representative of Stentor Enterprises Limited, currently the market is aware of the epoxy product since they started five years ago. Mainly, it is applied in the industrial and manufacturing sectors which have really appreciated this product. “We are trying to introduce the product in commercial and domestic sector which still uses the traditional concrete protection (tiles, carpets, terrazzo etc),” he adds. 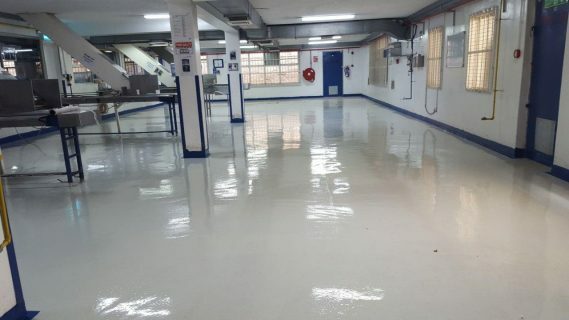 “Epoxy floors provide essential compliance with GMP requirements which entails minimum common sense sanitary and processing requirements applicable to all food processing establishments. Many food industries have implemented the GMP certification scheme for food processing as the foundation upon which they have developed and implemented other quality and food safety management systems, including HACCP, ISO 22000, SQF and ISO 9001,” he affirms.